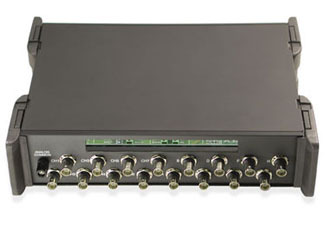 The OMB-DBK215 BNC connection module provides 16 BNC connectors for accessing analog I/O, digital I/O, or counter/timer signals. Each of the first group of eight BNC connectors is pre-defined as analog input and is jumper selectable as single ended or differential. Each of the second group of eight BNC connectors is configured by the user as an analog input or output, digital line, or counter/timer channel. Screw-terminal connections for remaining signals not configured for the BNC connectors are accessed by removing the OMB-DBK215’s top cover. Signal wires attached to screw-terminal connections are routed through a slot in the front of the OMB-DBK215. The OMB-DBK215 features a P5, 68-pin SCSI connector for connecting to an OMB-DAQBOARD-500 Series board. The OMB-DBK215 is housed in a shielded metal enclosure that can be mounted to other OMB-DBK signal-conditioning and expansion modules. A single OMB-CA-G55 or OMB-CA-G56 cable is used to connect the OMB-DBK215 to an OMB-DAQBOARD-500 Series board. 참고: Each OMB-DBK215 board is supplied with complete operator’s manual on CD ROM.